Cyan is conducting a live multi-vendor, SDN demonstration showing how network operators can offer their customers the ability to dynamically spin up data center virtual machines (VMs), along with virtualized network resources, via standard APIs or a web portal. The demo, which is being held at this week's Interop Tokyo, leverages OpenFlow and extends between an Ethernet-connected private enterprise and a cloud-enabled public or private data center. Specifically, applications running on an enterprise server dynamically place requests for additional cloud data center virtual machines and associated network resources using OpenStack application program interfaces (APIs) and OpenFlow. Cyan's Blue Planet SDN system services the request on behalf of network resources and proxies the compute and data center network demands to an OpenStack server in the cloud data center. Blue Planet performs all functions necessary to turn up additional services across the multi-vendor carrier network including carrier Ethernet and optical edge devices from Overture and Accedian Networks. The data center instance of OpenStack negotiates with compute resources and with Arista data center switches to allocate the necessary network and compute capacity. The SDN demonstration includes Accedian Networks' MetroNID GT, Arista's 7050S 10G/40G data center switches and EOS (extensible operating system) software enabled with E-API, OpenFlow and OpenStack Quantum OVS drivers, Canonical's Ubuntu operating system for OpenStack, Cyan' Blue Planet SDN system and Z22 packet-optical transport platforms, Overture Networks' Carrier Ethernet Access Devices, and RYU's OpenFlow controllers. "What’s really interesting here is the extension of SDN concepts beyond the data center and into the carrier network and enterprise. This closes the loop on service orchestration and also enables much more compelling business models both for data center operators and carriers (or any other network operator). The whole purpose of the Blue Orbit Ecosystem, also announced today, is to test SDN use cases and prove interoperability in multi-vendor environments. The SDN Use Case demonstration here at Interop Tokyo shows this work in action," Tom Corker, stated Cyan vice president of strategy. The demonstration builds on Cyan's new Blue Orbit ecosystem of software and hardware solutions for multi-vendor software-defined network (SDN) applications. 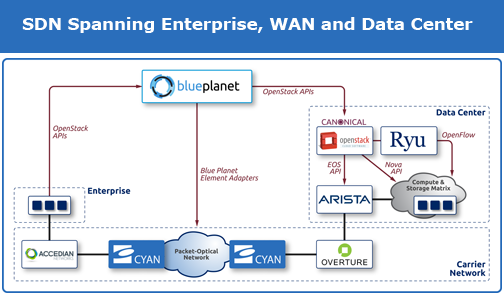 Initial members of Cyan's Blue Orbit program include: Accedian Networks, Arista Networks, Boundary, Canonical, (the company behind Ubuntu the reference operating system for OpenStack), Embrane, Overture Networks, and RYU (part of NTT Laboratories’ Open Source Software Computing Group). 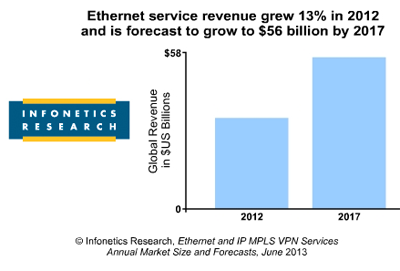 Ethernet service revenue, including retail and wholesale, increased 13% worldwide in 2012, and is expected to grow to $56 billion by 2017, according to a new report from Infonetics. Meanwhile, layer 2 and layer 3 IP MPLS VPN service revenue grew 8% in 2012, and is also on a healthy growth trajectory. With employees increasingly accessing corporate networks from personal devices for both business and personal use for apps like Facebook and private email, organizations are turning to less expensive IP and Ethernet services to cost-effectively deal with surging network traffic,” says Michael Howard, principal analyst for carrier networks and co-founder of Infonetics Research. "The BYOD trend is adding to the already-pervasive use of networks based on Ethernet and IP/MPLS from the home, office and road, and will help drive a cumulative $374 billion to be spent on Ethernet and IP/MPLS VPN services from 2013 to 2017." Mobile backhaul transport’s transition to IP/Ethernet continues: today over 94% of mobile backhaul spending is on IP/Ethernet equipment. The fastest growing Ethernet service revenue opportunities are in the >1G–100G segments. Asia Pacific and Latin America are expected to make up the largest share of IP MPLS VPN services revenue through 2017, due to population and GDP growth, and increasing use of broadband and mobile in South America. 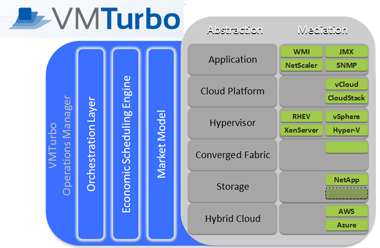 VMTurbo is rolling out a number of enhancement to its Operations Manager for software-defined control for cloud and virtualized environments. The Operations Manager 4.0 uses an analytic engine to drive control across the virtualization stack. Storage Cluster Support. Operations Manager now discovers storage clusters and limits virtual machine moves accordingly. If a virtual machine uses storage that is within a storage cluster, all moves of that storage will remain within that cluster. High Availability Constraint. Operations Manager recognizes dedicated- and shared-failover HA configurations and won’t recommend a workload move to a host unless another host fails in the HA cluster. Improved Shared User Roles. Operations Manager has improved its support for shared user accounts. Service providers can now masks views and/or metrics within views that are shared with subscribers. Export Dashboards to PDF. Dashboard displays may be exported to PDF files to generate reports based on the data presented in the user interface. Workload Utilization View. Provides an at-a-glance view of the overall health of virtual machines relative to the target utilization, with the ability to view details for smaller scopes of the environment. VMTurbo said a key advantage for its platform is its ability to dynamically allocate resources, such as spinning up new VMs locally or in AWS or Azure, while retaining policy controls for security, regulatory compliance, etc. Similarly, the VMturbo decision making engine now can intelligently look at the types of storage options are available, traffic loads, redundancy options, etc. Operations Manager 4.0 is generally available today and pricing starts at $699 per physical CPU socket. The add-on Application Extension starts at $199 per CPU socket and the Storage Extension starts at $599 per CPU socket, and are generally available. The Hybrid Cloud Extension is available to current VMTurbo customers in its Early Access program. 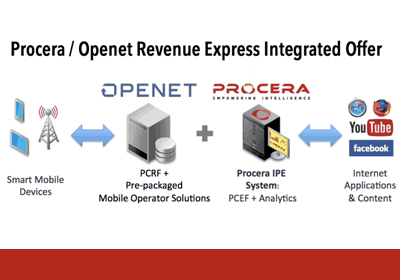 Procera Networks and Openet, which specializes in real-time transaction management software and services, introduced an end-to-end turnkey Policy Control and Charging (PCC) solution for mobile operators. The new Revenue Expres solution combines Intelligent Policy Enforcement and analytics coupled with Policy Management functionality. It delivers the full PCC components defined by 3GPP standards. Openet's software performs the Policy and Charging Rules Function (PCRF) and Procera's platform provides the analytics and Policy and Charging Enforcement Function (PCEF). The joint offering includes pre-packaged functionality designed to reduce cost of ownership and address time to market challenges faced mobile operators. One of several options available, for example, offers a Service Pass for customers who have exhausted their existing data limit, such as 500 MB of extra data usage for a number of days at a small additional fee. In this case, providing subscribers with simple transparent data purchase options that they understand not only reduces customer service calls, and costs, but also encourages them to experiment with data usage, creating new customer segments that often choose to purchase additional data. "Our policy work with Openet leverages both companies’ industry expertise and makes it possible for mobile operators to quickly meet common business requirements with reduced complexity and ease of operation,” said James Brear, president and CEO of Procera. "We look forward to continuing our relationship with Openet and finding new ways to bring our policy enforcement and analytics technology to all operators." 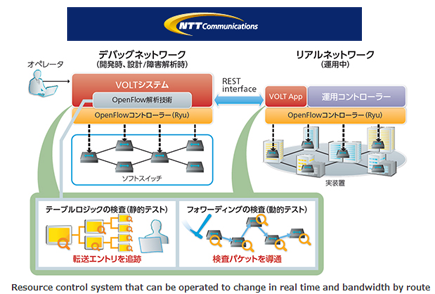 NTT is showcasing its Versatile Openflow vaLidaTor (VOLT) resource control system for software defined networking (SDN) at this week's Interop Tokyo 2013. NTT said VOLT, which was developed in partnership with Fujitsu, is able to duplicate the entire route information and configuration of OpenFlow. This can be used to test a new network under the same conditions as the real environment. The system consists of an MPLS edge router and controller. 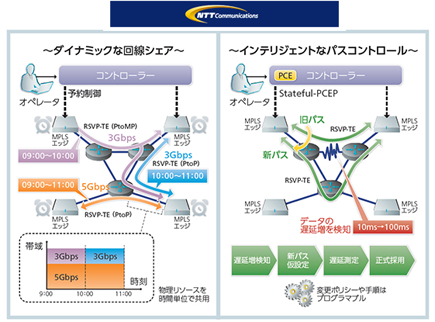 NTT West is testing the delivery of 4K TV streams over the Internet. 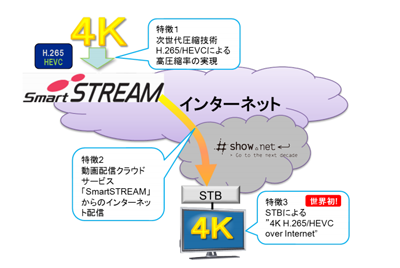 The trial, which is being held with NTT SmartConnect Corp., carriers 4K video (3,840 × 2,160) using H.265/HEVC compression to next generation set-top boxes. The companies are hosting a demo at this week's Makuhari Messe. 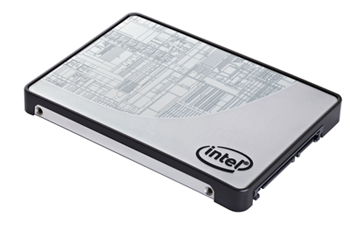 Intel introduced a new line of solid-state drives (SSDs) for data centers and cloud computing. SSDs offer significant gains for read-intensive applications such as Web hosting, cloud computing and data center virtualization, including faster performance, reduced power consumption, high multicore CPU utilization and better data protection are important requirements. The Intel SSD DC S3500 Series delivers sequential read speeds of up to 500 MB/s and sequential write speeds of up to 450 MB/s and a tight distribution of input/outputs per second with low maximum latencies. Random read performance can go up to 75,000 input-output operations per second. The new drives leverage 20nm Intel NAND Flash Memory technology with SATA 6 Gb/s interface support. The new SSDs will be offered in capacities ranging from 80 gigabyte (GB) to 800GB and both 2.5 and 1.8 inch form factors. Intel said the new drives are a replacement for traditional hard disk drives (HDD), allowing data centers to save significant costs by moving toward an all-SSD storage model. XO Communications' newly launched cloud service is being hosted from CoreSite's facilities in Northern Virginia and Los Angeles. XO is deploying at CoreSite's One Wilshire campus in Los Angeles, which provides proximity to over 180 networks and access to a large ecosystem of digital content providers and enterprises. XO Communications will also grow its presence at CoreSite's Reston data center campus, which is strategically located along rich fiber routes and connectivity across Northern Virginia and Washington, D.C., providing immediate access to communities of financial service providers, government-related agencies and other enterprises. "Expanding with CoreSite for our new XO Compute portfolio made perfect sense," said Don MacNeil, CMO, XO Communications. "Not only do its facilities meet our growing requirements and support the needs of our customers, but its East and West Coast data centers will enable us to seamlessly integrate our new cloud offerings with our existing network presence. The expansion gives mid-size and enterprise customers nationwide, especially in financial services, healthcare and business services, easy access to our cloud services with minimal latency and maximum performance." 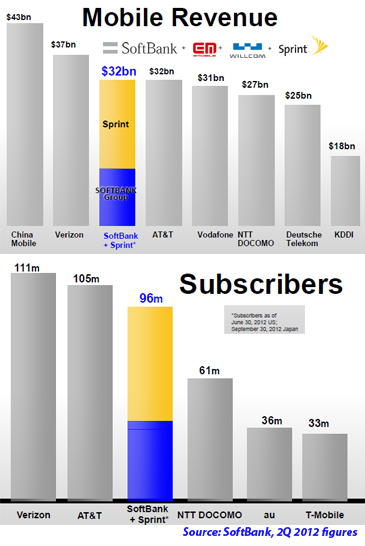 SoftBank sweetened its offer to acquire Sprint by an additional $4.5 billion, bringing the total cash consideration available to Sprint stockholders to $16.64 billion. Sprint's Special Committee and Board of Directors unanimously approved the amended merger agreement and have unanimously recommended to stockholders to vote FOR the revised SoftBank transaction. The company's board also said it has ended discussions with DISH due to a lack of an "actionable offer. There is now a deadline of June 18, 2013 for DISH to provide its "best and final" offer. 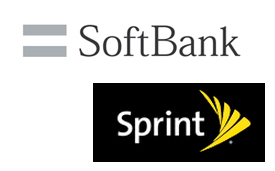 Sprint and SoftBank have rescheduled a Special Meeting of Stockholders from June 12, 2013 until June 25, 2013. Masayoshi Son, Chairman and CEO of Softbank, stated: "The amended agreement announced today delivers more upfront cash to Sprint stockholders, while still achieving our goal of creating a well-capitalized Sprint that is better positioned to bring meaningful competition to the US market. Our transaction offers significant value for Sprint stockholders and the opportunity to realize that value in just a few weeks, without the risks associated with any other potential transaction. We look forward to working with the Sprint management team to accelerate the build out of a nationwide LTE network, increase competition in the US market and drive subscriber growth in the years ahead."